After celebrating my one year blogging anniversary last month, I think that it is pretty cool that today I have the pleasure of introducing you to a small business who just celebrated their ten year anniversary in business. It is so great to hear from Nicole from Mally Designs, learn where she got started, some milestone accomplishments and the future goals she has for her business. My daughter, Sophie, has a pair of Nicole’s Mally Sandals and we just love how perfect they have been for us this summer. 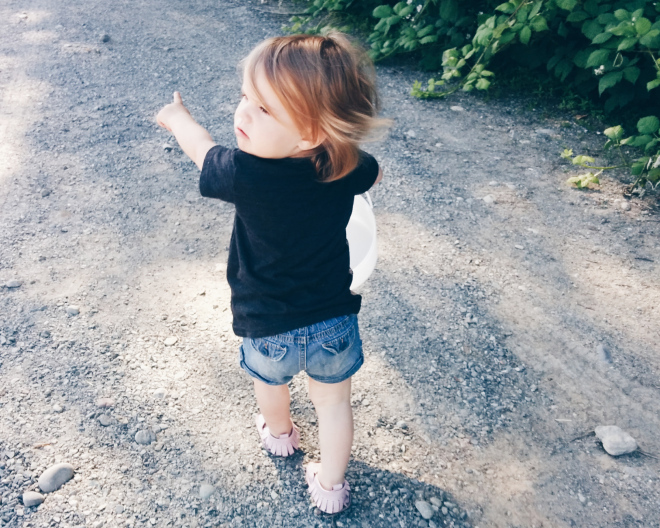 Sophie is just under two and already has a love for shoes, she is constantly trying to put them on her feet and favours her little pale purple sandals my Mally Designs. 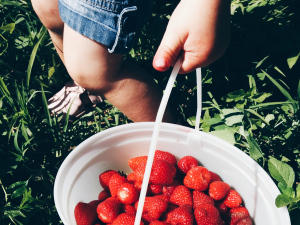 They have gotten a whole lot of love this summer and were even shown off in a recent blog post where I share some tips to a successful first time berry picking. The best part about the sandals was that with how dirty they got in the field, when we got home I got a cloth damp and easily wiped the dirt off, making them good as new again. Mally Designs started out by designing and creating award winning leather bibs for babies and toddlers. The bibs are created with their signature designs or custom to your needs. You can see some of my favourite bib designs here and here. From bibs this company has soared to selling shoes, place mats, travel accessories, bookmarks, and more. Now let’s bring it back to the beginning and hear a summary of their business venture so far. Back in 2005, while I was on maternity leave with my daughter Malia, I was feeling frustrated with the fact that her many bibs were staining. I decided to try making bibs out of leather, since I found it to be such an easy to clean material. The rest was history! Within a few years, we had an award winning product on our hands and this gave both myself and my husband the ability to quit our careers and work from home building our business, doing something we truly love! Over the years, we have hit many milestones and learned a lot, but I think the accomplishment we are most proud of is the balance we have achieved. We have really built a lifestyle business around being able to have the time for family, friends and most importantly, our kids. We make sure we go on a family vacation or two every year, and we try to make every weekend a long weekend by taking Friday off early. I guess you could say we truly live life to the fullest! Family and friends are far more important to us than money. Our goal has always been to build this business around what our customers want, by designing useful and functional products unlike anything that exists on the market. It’s easy to simply copy a product that has already gained popularity. Anyone can do that, but our goal has always been to create products that are extra special. For example, our mocs are made from baby safe leather, they have a tabs at the back to make them easy to put on, and the soles are non-slip suede in a beautiful grey colour to hide the dirt. We saw these all as missed opportunities on the market. After launching our Mally Mocs last year, many customers told us they wouldn’t put them on their little one in the summer months. We saw both a sales opportunity and a need on the market for a more breathable baby moccasin. After a few days of playing around with the design of our moccasins, we camp up with our sandal mocs. Their popularity has overwhelmed us, as we truly fulfilled an untapped market once again! Join me in celebrating Mally Designs on their first successful ten years by visiting them on social media and saying hello. You can find them on Facebook, Instagram and Twitter, don’t be shy. What a huge accomplishment to the both of you and many many blessings for many more successful years to come.